Part Two of our 2015 Trilogy of tours starts in two weeks. This will be a different trip to the previous big August European trips because we will be limited by our available time off work to a 10 day trip as opposed to the usual 20 day tours. There will only be three of us travelling this year and unusually for a Summer tour, we are bringing the dog. With all of this in mind, we are pretty much sticking to the northern half of France (apart from one night in Belgium) and renewing our previously lapsed Disneyland Paris Annual Passes. The tour will still take us to places none of us have been to before and hopefully the weather will be kind to us. 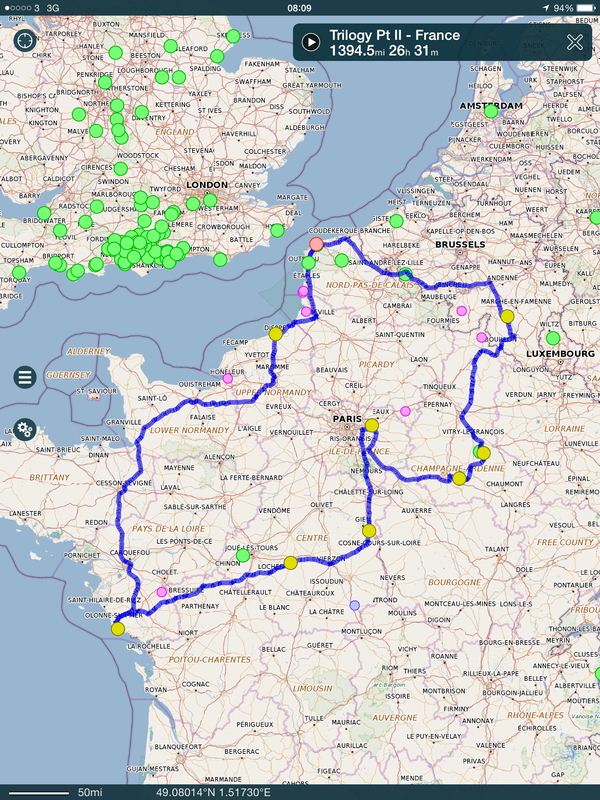 Here is a map of our current plan (Yellow dots are where we plan to stay, Pink/Purple dots are possible alternate places and Green dots are where we have stayed before): To get daily updates after we have set off, please follow this Blog by adding your email in the box at the right hand side of this page. I would definately recommend an overnight stop at Honfleur. Great views of the Pont Normandy from the large aire, €10 with electric and water, and the town is really lovely. Enjoy, we found Honfleur to be just lovely!